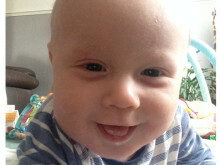 In 2013, we supported Alfie's family at Crawford House when he was rushed to Newcastle's Royal Victoria Infirmary after he stopped breathing. Alfie was there for two weeks before sadly passing away. 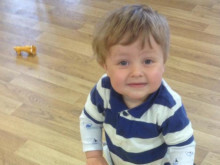 Since then, his family have raised £20,000 for The Sick Children's Trust. 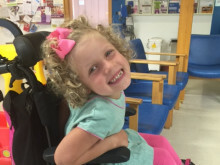 Next Friday, Amanda and her family will be heading to Dalton Park's Trick or Treat Trail along with 80 others to raise money for The Sick Children's Trust. 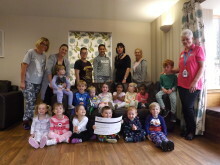 Free Spirits Nursery at Freeman Hospital half a Pyjama Party and raise over £1,000. 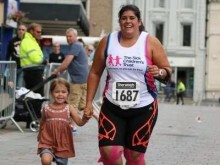 This weekend,Christina will take part in the Royal Parks Half Marathon - read her story here. 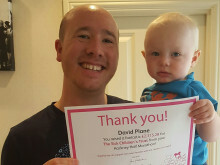 Paul Richardson, along with his sister Karen, is running the Royal Parks Half Marathon a week on Sunday to thank The Sick Children's Trust for giving him and wife Deborah a 'Home from Home' when his son was born seriously ill.
Our All Out For Cricket in The City was yet another success. Thank you to everyone who supported it. James and Amy Boulton are supporting The Sick Children's Trust's Pyjama Party as thanks for giving them a 'Home from Home'. Without Chestnut House I would have felt very alone. "They helped us so much in our time of need, and now we're going to help them." 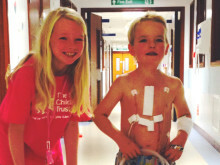 Charlotte and Nick Ford are encouraging friends and family to get involved with The Sick Children's Trust's Pyjama Party this October. Eckersley House was like a haven, away from the hustle and bustle of the hospital but close enough for us to go straight back if needed. "For any parent, having your child in hospital is stressful and draining, so please get involved with Pyjama Party"
Nafferton Primary School pupils donated £400 worth of gifts to The Sick Children’s Trust’s ‘Home from Home’ Eckersley House after their teacher told them how much Eckersley House. Dave Plane and Lesa Bennett are encouraging their local community to get involved with the Pyjama Party this October. 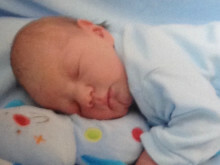 If it wasn’t for Stevenson House, we’d have felt like we’d abandoned him. 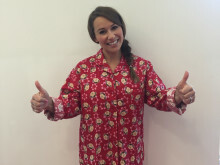 Join Jen Pringle this October in The Sick Children's Trust's Pyjama Party. From Monday 17 October - Friday 21 October we are asking nurseries and playgroups to hold a Pyjama Party to help raise raise money for families with seriously ill children in hospital. 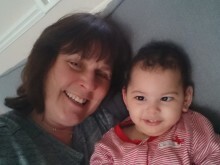 Debbie and Alec Berry are running the Great North Run for The Sick Children's Trust once again. This time last year they were staying at Scott House while their baby Joseph at Freeman Hospital. 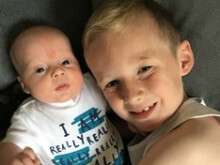 Emma will be running this weekend's Junior Great North Run to raise money for Scott House after we kept her by her twin brother's bedside when he had open heart surgery. Mimi Clarke has been fighting a brain tumour over the last three years and has inspired a group of 11 men to cycle over 1,000km to raise money for Acorn House. 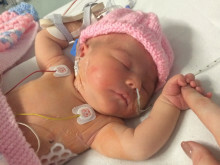 Auntie Lorren will be running this Sunday's Great North Run to say thank you for supporting her brother Joshua when his daughter and Lorren's niece Anabelle was in the RVI. 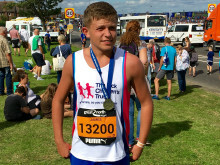 Rich Stainthorpe is on a fundraising mission to raise as much money as possible for The Sick Children's Trust and East Anglia’s Children’s Hospices. 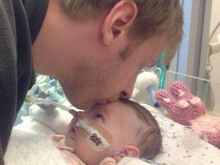 Rich and partner Donna were supported in Acorn House when their baby daughter, Imogen, sadly passed away at just over six weeks old. 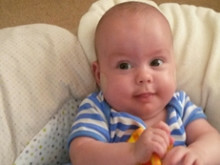 East Anglia’s Children’s Hospices supported the family following their tragic loss. 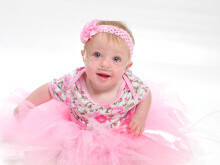 Seven years ago, Hailee gave birth to her daughter Charlotte six weeks early. 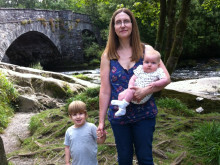 Charlotte needed an emergency operation for a hole in her abdominal wall and was transferred to the Royal Victoria Infirmary. 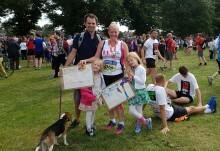 We supported her and partner Nick at Crawford House.